E's Van's RV-14A: First Flight! The aircraft has been flown! No significant squawks. 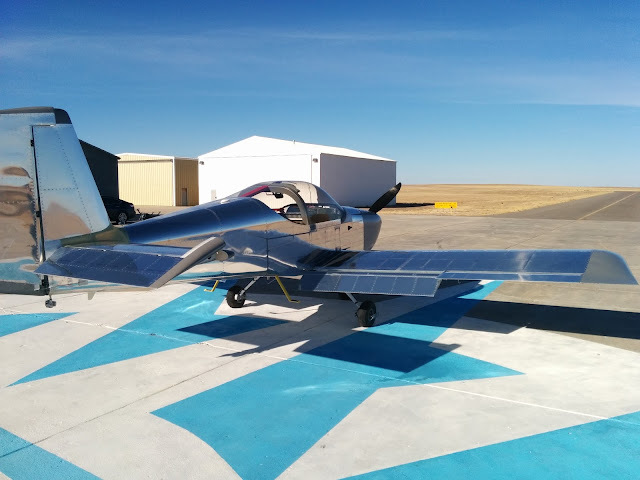 It flies straight, no heavy wing and the rudder hardly requires attention in flight. Whilst I'd like to take credit for building the aircraft with highly-skilled craftsmanship, that the aircraft flies so well is more likely due to the kit design and fabrication. 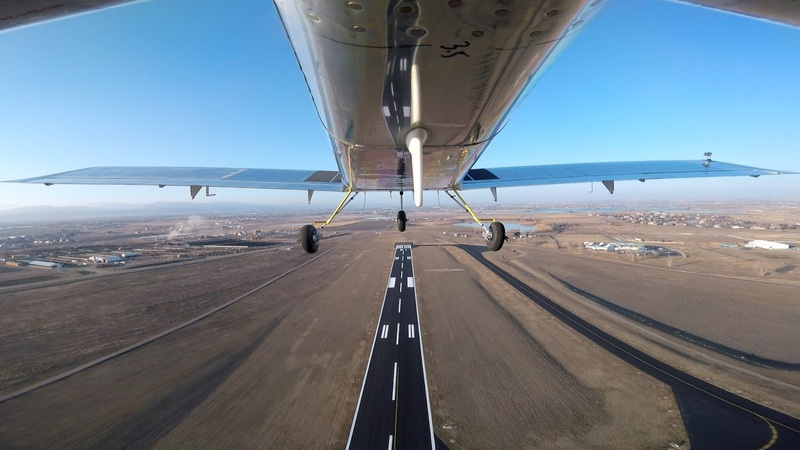 Crosswind turn after first takeoff. 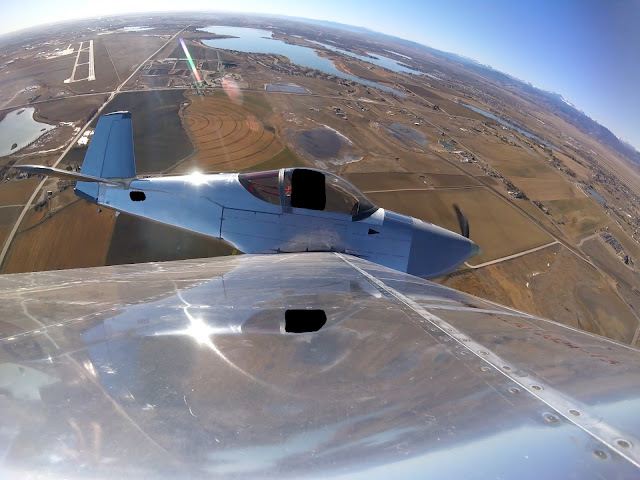 This 1920x1440 image is from a GoPro Session using the PlaneAround wing mount. Tail camera is visible below tail. Base-to-final turn on landing following the second flight. This 1920x1080 image is from a GoPro HERO2 using the PlaneAround tie-down mount. Wing camera is visible on right wing. Third take off. This 2704x1520 image is from a GoPro HERO5 Session using the PlaneAround tie-down mount. The HERO2's resolution limited the clarity of the image at the tail (as seen above), so I picked up the HERO5 Session to capture more detail. Wing camera is visible on right wing. The following week, my aircraft visited the first airport away from home, one of the few permitted by my operating limitations under Phase I. It was also an opportunity to use the field's compass rose to calibrate the magnetometer again. If you look carefully, you can see the GoPro cameras on the left wing (HERO Session), under the tail (HERO5 Session) and the two mounted under the canopy (Fusion and HERO6 Black). 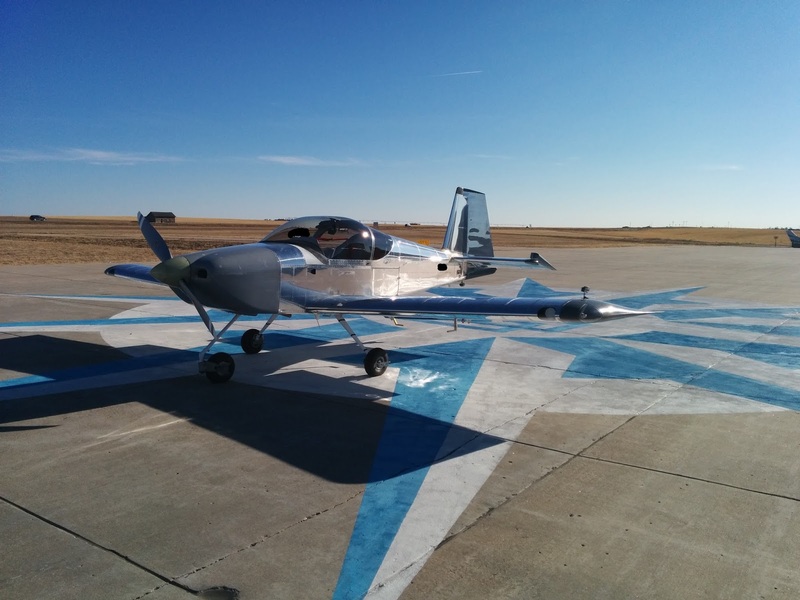 During a day of ground testing, prior to first flight day, another RV-14A happened to stop by. The aircraft's pilot requested a photo-shoot. Turns out, one of these planes is wearing pants, the other isn't. The one item worth mentioning is that initially the prop would not cycle even up to 2,000 RPM on the ground. This was a cause for concern and unacceptable for flight, obviously. A day was spent making phone calls, examining the governor installation and searching the web for similar experiences. Turns out this is a normal occurrence and probably exacerbated by the prop sitting unspun since delivery in Sep-15, some 2.25 years ago. After manually cycling the prop with boards (as shown on 44-07 in the plans for cutting the spinner to accommodate blade travel) in the hangar some 20 times then bringing the engine up to 2,100 RPM on taxi, the prop loosened up and then could cycle down to ~1,700 RPM. 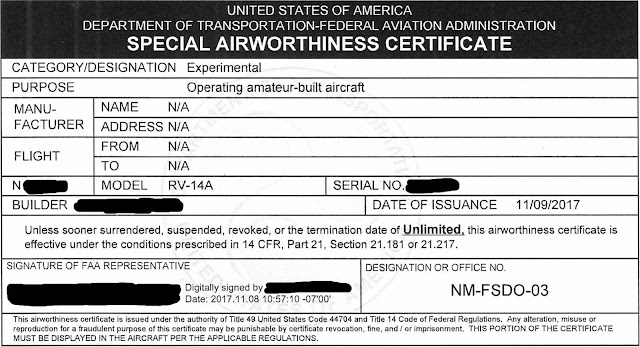 I made the decision to build an aircraft on 4-Jul-12. My decision to build an RV-14A was made a few weeks afterwards. My wing kit was ordered on 12-Feb-13 and received on 10-Apr-13. It took 4 years and 8 months from start of construction to first flight. Though generally I worked on the plane consistently, there were several months of inactivity due to domestic and employment affairs and similar such distractions . 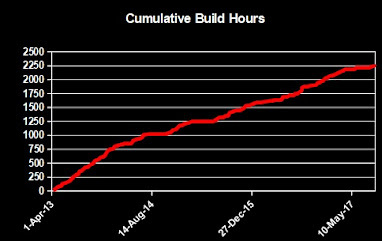 The cumulative build hours graph, shown below (also on the right column of this blog), records my building activities. 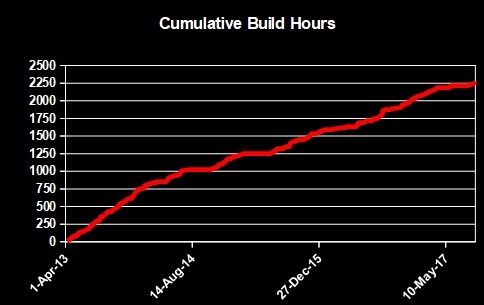 As shown on the right column in this blog and below, 2,196.01 hours total build time were invested (includes all redone parts). An additional 599.69 hours of help from eight others was obtained, each of which were invaluable to finishing the project. A single helper donated 461 hours of his time to my build - the aircraft could not have been completed without him and to whom I owe a massive debt of gratitude for his dedication to my aircraft. Thus, it took 2,795.7 hours to build this aircraft. No quick-build kits were used. Panel design, fabrication and all aircraft wiring were done by me. My POH can be found here. Total cost, as shown on the right column of this blog and below, was $155,737.88 (includes tools and redone parts). And thank you very much for your valuable blog, I have been following you almost since you started. I hope to make my first flight in 2018. Thank you kind sir! I've appreciated your comments over the years. Keep me apprised of your efforts. Build on my friend. AMAZING!!! Your blog has been invaluable as I slog my way through the RV-14 project. Lots of fun and frustration. Would love to see more writeups as you go through Phase I and beyond especially your observations on flight characteristics. I'm glad the blog has been useful to you. Makes all the time I spend on the upkeep worth it. I'll continue to post items of interest. Thanks! Congrats! I've been learning from your blog since 2016, before starting my RV14a. Well done. Just mounted my engine in January, so may be flying in less than a year. Looking forward to following your progress in phase 1. Thanks buddy! You're nearing the finish line!